A while back, like a long while back, I had told you that I had painted Emanuelle’s desk and dresser. Do you remember? That was last year!! Anyways, I’m happy to say that I have finally taken photos of the furniture! YAY! 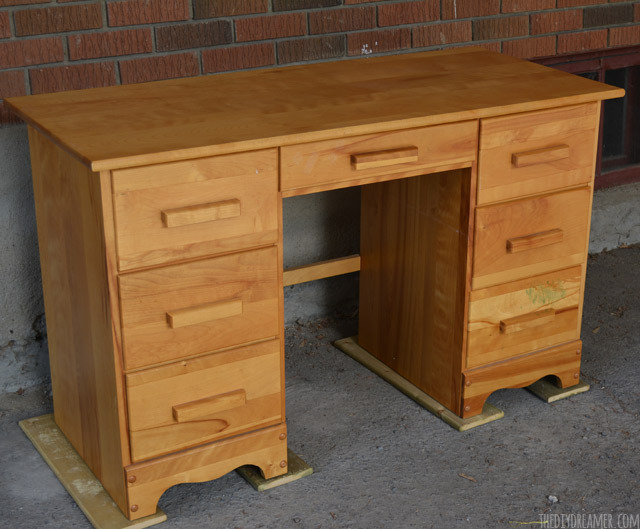 The desk and dresser have belonged to Sébastien for the longest time. He had them in his bedroom when we first started dating 16 years ago! When we moved in together, they followed us (you don’t just get rid of wood furniture!). Emanuelle’s bedroom use to be our office, and when she was born we left both those pieces in the room. 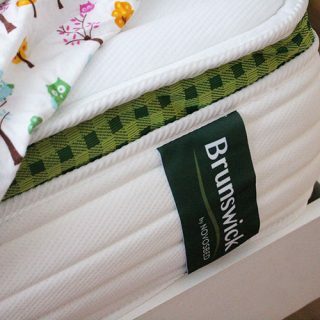 We used the desk as a changing table, we stored diapers and blankets in the drawers. The dresser became her dresser. We never did anything to the furniture, we just left them as is. This post contains some affiliate links for your convenience. Click here to read my full disclosure policy. 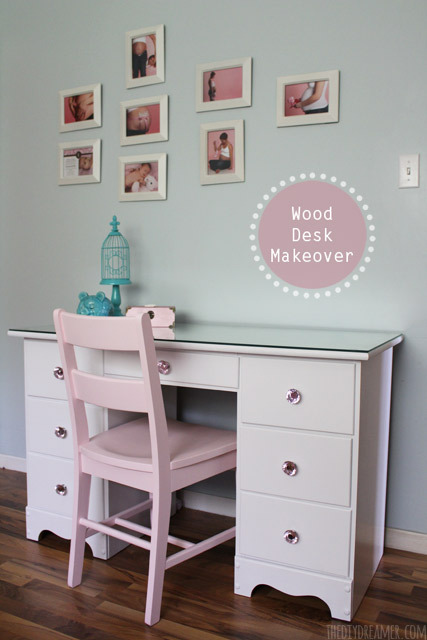 After we made her big girl bed and shutter headboard, we figured it was time to give the desk and dresser some love. We took out some paint and gave both pieces a new fresh look, perfect for Emanuelle’s bedroom. Step 1: We started off by removing the handles from the desk and dresser. 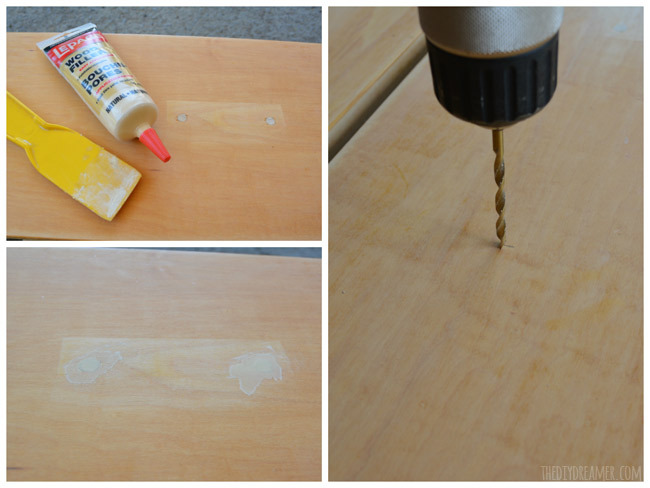 Step 2: We sanded both pieces enough so that most of the varnish was gone. Step 3: We were changing the handles completely so we needed to fill in the holes from the previous handles. 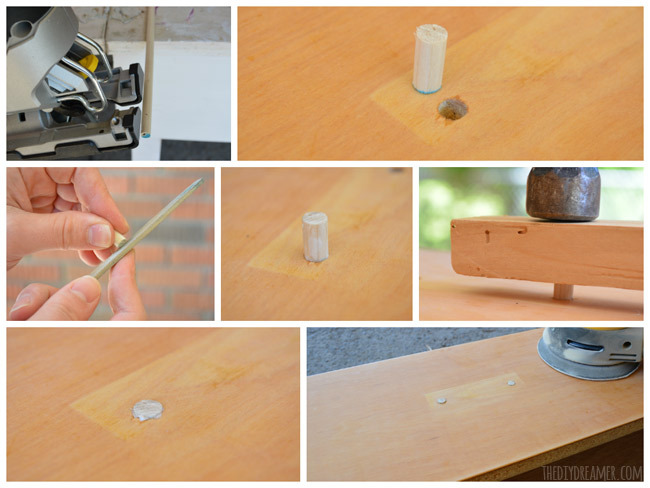 We made our own wood plugs by cutting pieces from a wood dowel. The plugs were a little too snug, so we filed them down a little. We put a little bit of glue around the plugs. We placed the plugs over the holes and used a piece of wood and hammer to hammer them into the holes. 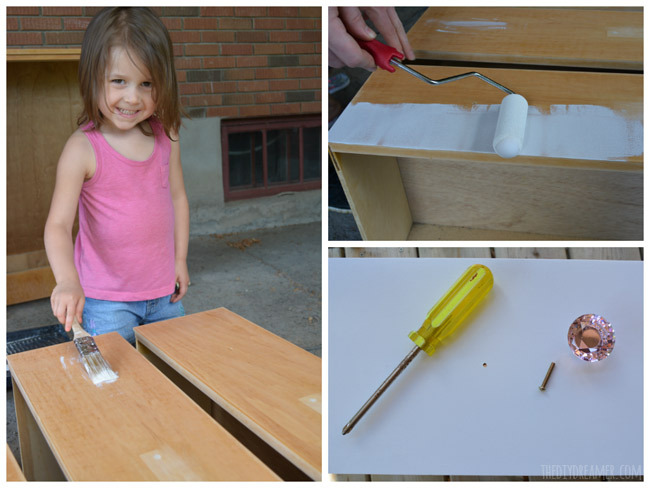 (We used a piece of wood to prevent hammer marks on the furniture). 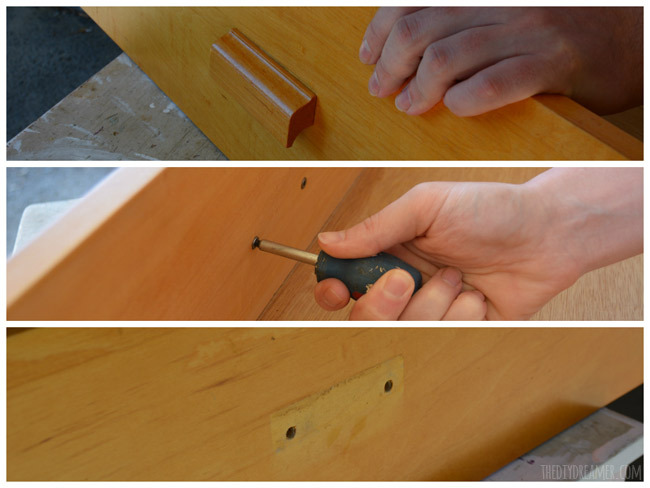 Once the plugs were secured in place, we sanded them down until they were flush with the rest of the drawers. Step 4: We used wood filler to fill in the gaps around the wood plugs. Once dry, we used the rotary sander to sand them down. (When you rub your fingers over the plugs, you shouldn’t feel them… if you do.. sand some more.) We marked down where we wanted the new handles and drilled the new holes. We sanded lightly over the new holes. 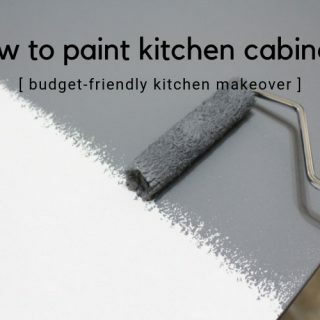 Step 5: We applied 2 coats of paint on both pieces of furniture. (As you can see, Emanuelle helped too!) Once the paint was dried, we added the new pink crystal drawer pulls! We also added a glass top onto the Ema’s desk for extra protection (she likes to draw on everything!). What do you think? Don’t they look fabulous? I love how the white brightens her room! And the pink crystal drawer knobs are soooo pretty! She loves how sparkly they are, she says they make her bedroom feel like a princess room! Lovely makeover, Christine!! I love the picture of your little one helping along! Beautiful makeover! I love that you switched out the handles for something different. Would love for you to share at this week’s Fridays Unfolded! Great makeover Christine! Love the pulls you chose, so girly! They look awesome, Christine!! What a transformation! Wonderful, wonderful job! So pretty Christine – what a beautiful transformation! Your furniture looks great! We just painted a desk for my daughter too! I still need to paint the chair before I “reveal” it in her room. Thanks for sharing at my Creative Ways Link Party! Hope you are enjoying a nice long weekend! 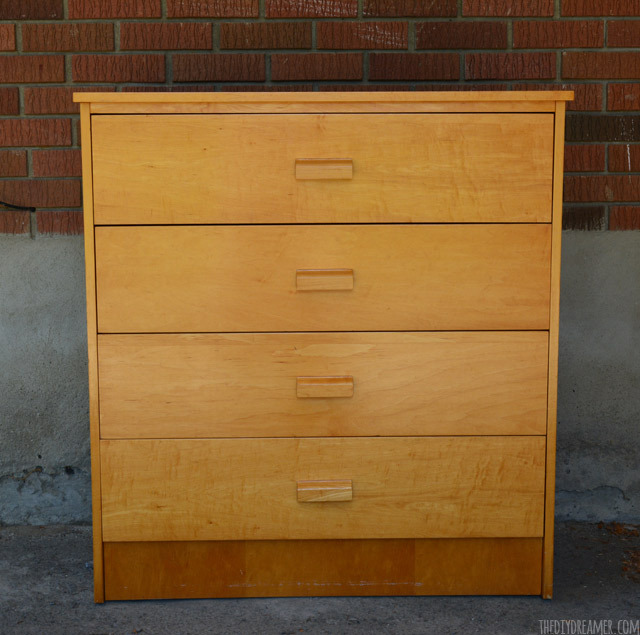 That is the most amazing makeover – I now have ideas for the boring wooden chests in my kids’ rooms! AMAZING, Christine! You would never know that is the same furniture. Such a transformation, and I adore the shade of pink you chose. Pinning and sharing! Wow! These look amazing, Christine! Huge transformation! I love your choice of color/knobs! What a transformation. They look fantastic. The knobs are awesome. I’d be thrilled if you’d link up at this week’s Off the Hook! The pink crystal knobs are pretty! And the furniture is perfectly suited for a little girl’s room. You did a terrific job on the dresser and desk. The glass top on the desk is genius! WOW- how cute and you make it look so EASY! I am inspired. Beautiful job Christine – and Emanuelle is just gorgeous !!! 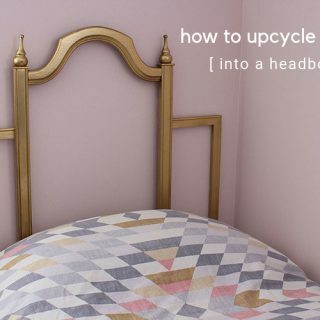 It looks so sweet and feminine without being over-done – great job! It’s amazing how much character the pulls give! I love how this turned out Christine and love that it was your husbands. They just don’t make furniture like that anymore. The soft colors are so pretty and I love the knobs! One lucky girl! WOW, it looks fantastic! 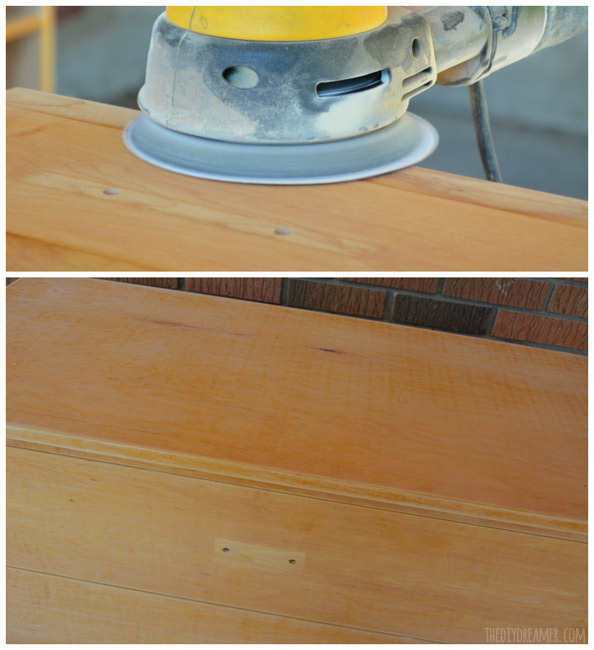 I have to show this DIY to my husband, who is super handy ;) It turned out just gorgeous! Oh it looks so great! Such a great before and after. Thanks so much for sharing with us at The Makers! Beautiful! I especially love the hardware you chose! What a great transformation! I love the chair, too! 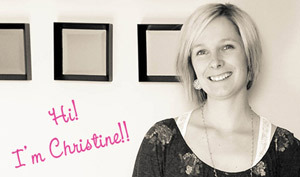 Love the pink, Christine! I know your daughter must love it! LOVE it! 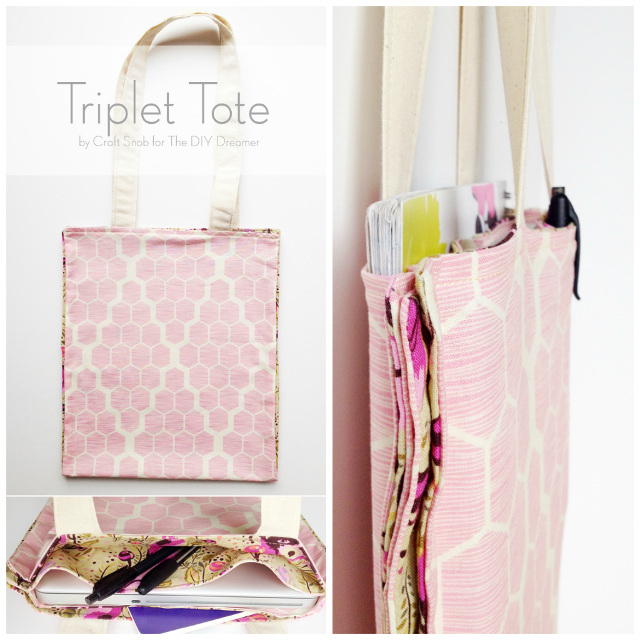 The pink handles are perfect! Love how this turned out. 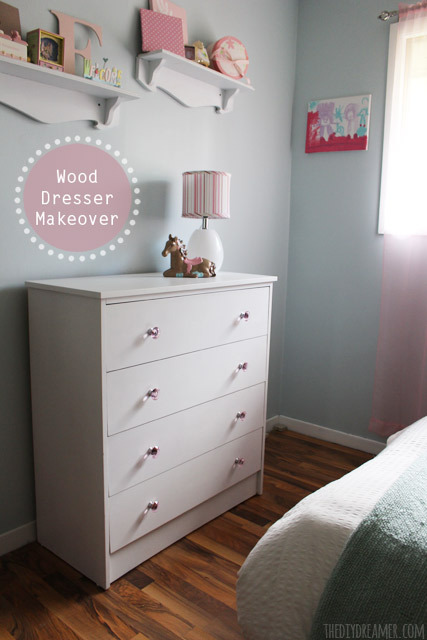 Those pretty pink drawer pulls are perfect :) Thanks for listing the type of paint you used I’m always looking for recommendations on a good paint + primer for refinishing furniture. It looks so different from the before-love it! I never tire of seeing old things become new again! So cute! 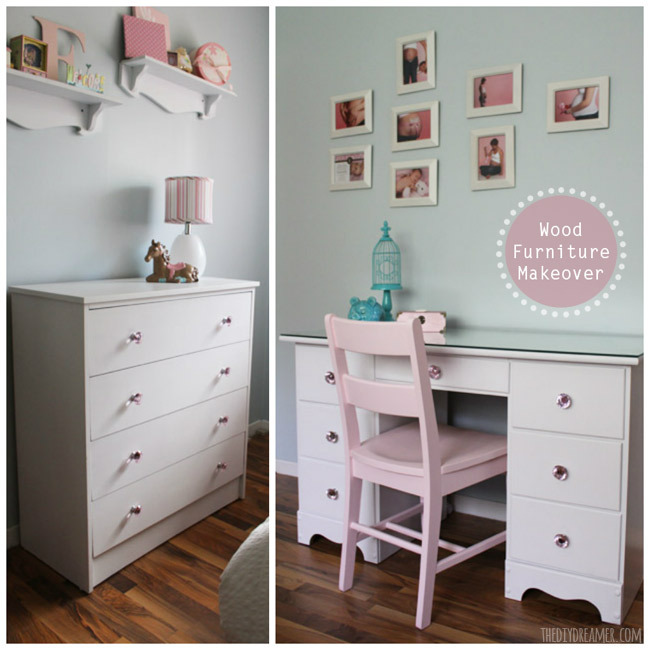 Love the crystal knobs and that you paired the pink chair with the white desk – so sweet! Looks like a perfect little girls room. Wow..so nice! I would love to be able to do this but just not possible. Your furniture talent makes such beautiful funiture! Good job! What a beautiful difference this made! I’ve been wanting to paint the furniture in my daughter’s room white, so this has certainly inspired me! You baby girl did a lovely job painting. You did a good job too. This is a good tutorial I am able to understand everything that you explained. I wanted to change the pulls on one of my girls dresser to one knob but was worried about the holes. Glad I came upon your post. This furniture is so adorable. I love the crystal drawer handles and the pink. WOW! The makeover is really amazing. 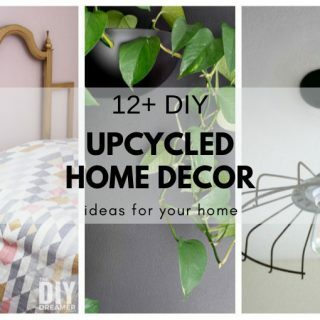 It feels surprising to see that with a few very simple DIY steps, you can do such beautiful makeovers. 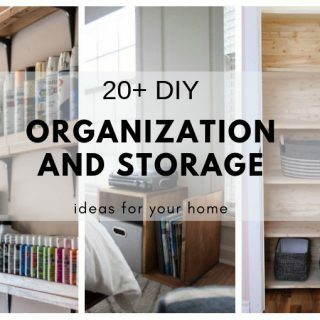 That outdated wooden cupboard now looks great. And the color combination is even awesome. Your daughter is very cute. 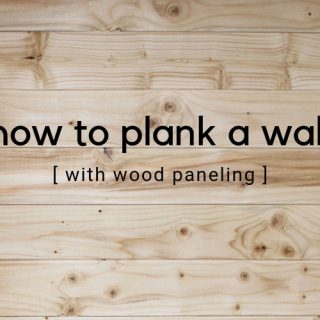 Great work and thanks for sharing the tips with us.